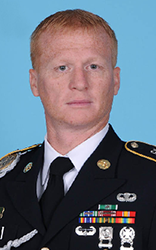 39, of Springboro, Ohio, died Oct. 4 in southwest Niger, as a result of hostile fire while on a reconnaissance patrol. He was assigned to 3rd Special Forces Group (Airborne), Fort Bragg, North Carolina. The incident is under investigation. WASHINGTON — The Pentagon on Friday released the names of the three soldiers killed this week in Niger while conducting a joint patrol with Nigerien forces. Staff Sgt. Bryan Black, Staff Sgt. Jeremiah Johnson, and Staff Sgt. Dustin Wright died Wednesday. All three were assigned to the Army’s 3rd Special Forces Group at Fort Bragg, North Carolina. Black, 35, served as a Special Forces medical sergeant, also known as an 18D. The native of Puyallup, Washington, enlisted in the Army in October 2009, according to a statement from U.S. Army Special Operations Command. Black earned the Ranger Tab and Special Forces Tab while in the Army. Johnson, 39, served as a Chemical, Biological, Radiological, and Nuclear Specialist, also known as a 74D. He enlisted in the Army October 2007. He was from Springboro, Ohio. Wright, 29, was a native of Lyons, Georgia. He served as a Special Forces engineer sergeant, or an 18C. He enlisted in the Army July 2012. Wright earned the Special Forces Tab. Two other U.S. service members were wounded in the attack in southwest Niger. U.S. forces are in Niger helping train and advise Nigerien security forces; they are not serving in a combat role, according to officials at U.S. Africa Command. The country is also host to a small U.S. drone base that operates surveillance and intelligence drones. Niger is a hotbed of Islamist insurgent groups to include al Qaeda in the Islamic Maghreb, or AQIM, and Boko Haram. Officials at the Pentagon refused to provide further details on the incident during a televised briefing on Thursday, citing ongoing operations and force protection issues. Little information has been made public about the incident, and the attack is still under investigation.